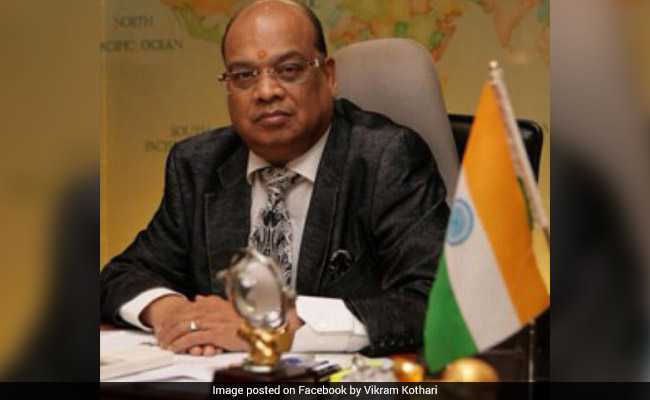 Vikram Kothari and his son were arrested on Thursday for alleged default on loan repayment after their four-day consecutive questioning since the CBI filed the case against them and raided their residential and office premises in Uttar Pradesh's Kanpur. Vikram Kothari and his son were arrested on Thursday for alleged default on loan repayment. New Delhi: A CBI court on Friday sent Rotomac owner Vikram Kothari and his son Rahul to one-day transit remand while the Income Tax department seized 12 bank accounts of the group and issued six prosecution against the businessman in connection with the Rs 3,695 crore loan default. Additional Chief Metropolitan Magistrate Samar Vishal at the Patiala House courts passed an order for a day's remand after the Central Bureau of Investigation (CBI) sought a two-day transit remand to take the father and son to Lucknow. Mr Kothari and his son were arrested on Thursday for alleged default on loan repayment after their four-day consecutive questioning since the CBI filed the case against them and raided their residential and office premises in Uttar Pradesh's Kanpur. Meanwhile, an Income Tax department official said over 12 more bank accounts of the Rotomac Group Pvt Ltd have been attached in addition to the 14 bank accounts attached earlier and that six prosecutions have been sanctioned against Vikram Kothari. The agency filed the FIR on Sunday night after getting a complaint against Mr Kothari, his wife Sadhana and son Rahul, from the Bank of Baroda. Vikram Kothari is the Chairman and Managing Director of Rotomac while his wife and son are Directors. Mr Kothari had obtained Rs 2,919 crore from Bank of India (Rs 754.77 crore), Bank of Baroda (Rs 456.63 crore), Indian Overseas Bank (Rs 771.07 crore), Union Bank of India (Rs 458.95 crore), Allahabad Bank (Rs 330.68 crore), Bank of Maharashtra (Rs 49.82 crore) and Oriental Bank of Commerce (Rs 97.47 crore), the FIR said. Mr Kothari, his wife, son, firm Rotomac, some unidentified bank officials and private persons were booked on charges of criminal conspiracy, cheating and forgery under the Indian Penal Code and Prevention of Corruption Act. The CBI had earlier confiscated several belongings of Mr Kothari and his family, including laptops and mobile phones.